Even though the Brewers lost today to the Phillies, I'd like to congratulate them on making the playoffs behind the brilliant mid-season acquisition of C.C. Sabathia. Thinking of the Brewers today reminded me of my favorite ballcard when was kid. 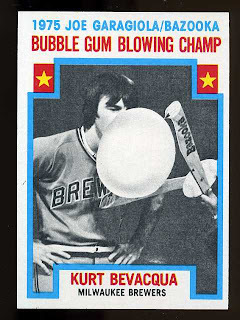 The first packs of cards I ever bought were 1976 topps baseball cards, and my favorite card was #564, the 1976 Kurt Bevacqua Bubble Gum Blowing Champ card. I thought it was really cool that there was a bubble gum blowing championship in the first place, and I was amazed that Kurt Bevacqua was blowing a bubble twice as big as his entire head! The back of the card shows the entire bracket with winners of each match. 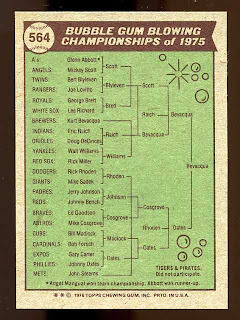 There were 22 participants from 22 different teams, and somehow Kurt Bevacqua from the Brewers and John Steams received byes in the first round. Not something I would be bragging to my Grand Kids about. "Hey, Grampy was the blowing champ back in the day."